I’ve been a superhero RPG fan for a long, long time. It all started when I chose to branch out from D&D during the 80’s with the original DC Heroes RPG from Mayfair. From there, I graduated to the color-coded charts of the TSR Marvel Super Heroes game and was eventually introduced to GURPS Supers and, what I consider a landmark moment in my growth as a gamer, the “big blue book” of Champions 4th edition. Later on in life I would also try out Mutants and Masterminds and Heroes Unlimited. On top of all that, I have tons of other superhero games that I own but have never played, such as Golden Heroes, Villains and Vigilantes, and many others. Recently, I’ve been going through my large collection of RPGs doing a bit of cataloguing and remembering all the great fun I’ve had with these games over the years. 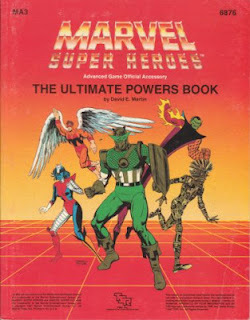 For the blog, I thought it would be fun if I put together a few posts detailing my thoughts about many of the superhero RPG products on the market, beginning with—what I consider—the best of the best. My favorite is Hello Kitty girl. Let me start out by saying that the list presented in this post is entirely personal—it is /my/ favorite products, and while I believe that these books are all great and deserving, I’m not attempting to say that they are going to be the best for everyone’s varied tastes or home campaigns. Secondly, I’m not going to cover superhero RPG systems or adventures in this list… instead, I am focusing on sourcebooks, which are generally aimed at a specific genre, setting, villains, organizations, or rules to assist with (IMHO) the typical interpretations of superhero gaming. Also, these are products that I personally have read and used in my superhero gaming. Necessary Evil is a great book, but I haven’t really used it yet, and I hear great things about Kerberos Club, for example, but neither is on the list for the reasons stated above. Lastly, this “top ten” is arranged in a very loose order in increasing level of usefulness to a typical superhero GM. Now, with all of that out of the way, let’s begin the countdown! Alas, not the greatest cover art in the Champions 4th ed. lineup. Watch out, Seeker! I must admit, I struggled over the #10 spot on this list—there are /many/ excellent superhero products out there. In fact, I plan on a follow-up post that covers the “notable” superhero RPG entries that competed but did not quite make it onto the top 10 in the near future. 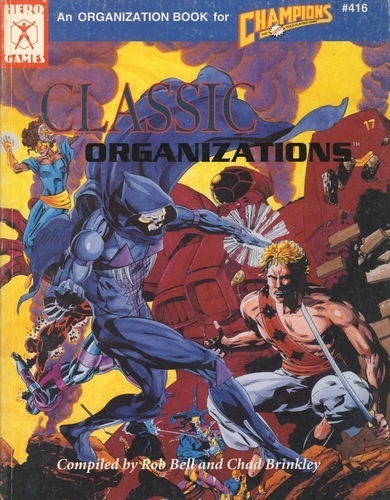 Classic Organizations is a Champions 4th edition product and is one of the oldest (next to Strike Force) products on the list. What makes Classic Organizations such a useful and interesting book is that it is actually a combination of four different products, each one showcasing one (or in one case, two) group perfect for most superheroic campaigns. The book begins with Neutral Ground, a section that covers a particular club that, as the name suggests, is considered off-limits to super-battles and is a good place for heroes and villains alike to meet, talk, or simply relax. I’ve often found that encouraging your players to talk things over with the villains can be just as (or sometimes, even more) effective than just encountering them only in confrontations and fights. Next, the book covers Red Doom, describing two superteams from the USSR (this book was made in the late 80’s, and the view on Russian supers inside is definitely dated from that period…). Some of the characters are quite interesting and unique (such as St. Peter’s Star and the Scarlet Sentinel), but many others are fairly pedestrian and unimaginative (Perestroika comes to mind…). Primus and Demon forms the next part of the book, showcasing a government agency named PRIMUS that is very reminiscent of SHIELD from the Marvel Universe that nevertheless has some distinct and unique features, and a supervillain group of magicians, sorcerers, and supernatural creatures that goes by the code-name of DEMON. Lastly, the book ends with a look at the goofy and comedic group, CLOWN—many Champions fans are divided about CLOWN, but I find this section of the book to be less about something I’d use in a campaign (making fun of superheroes is something you shouldn’t do lightly, especially if the superheroes are the player characters!) and more for the interesting and unusual write-ups. Classic Organizations is worth a look for inspiration, cool characters, story hooks, and adventure seeds. 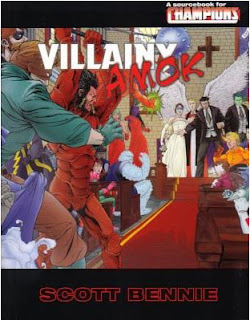 The first of two products on this list to feature the creative skill of Scott Bennie, Villainy Amok is an extremely handy sourcebook chock-full of classic superhero scenarios. From bank robberies to towering infernos and alien invasions, Villainy Amok gives the GM everything he needs to stage a fun and engaging scenario for his superhero team. One thing I really appreciate is that some of the art pieces tell an entire story by themselves. Villainy Amok is the only Champions 5th edition product on this list, and there’s a good reason for that—although I would argue it would be a standout book for any superhero RPG. The only reason it isn’t higher on the list is some of the production values (art was a particular problem for Champions 5th edition), and it should be noted that while Villainy Amok is great for one-shots and single sessions of an ongoing campaign, it does not offer a lot of support for long-term campaigns. These are extremely minor flaws, however, for a very, very good book that deserves a spot on any superhero GM’s shelf. Art by George Perez. Look out, Seeker! D’oh, too late. 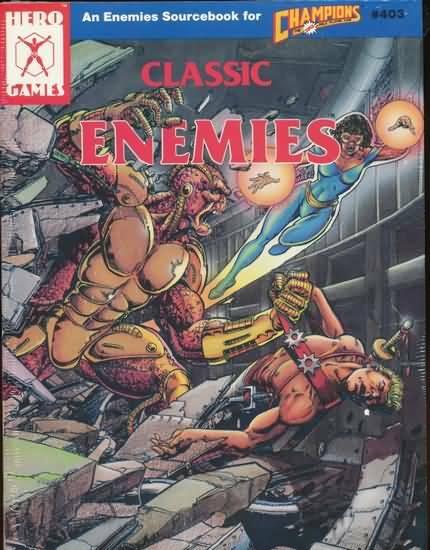 This, along with the #1 entry on the list, is the product that drove me wholeheartedly into the embracing arms of the Hero System—Classic Enemies is a brilliant collection of bad guys for any superhero game. Lovingly illustrated by the incomparable Pat Zircher, this book has everything you require for a really good and fun superhero rogues’ gallery. This product introduced me to the world-conquering threat of Dr. Destroyer, the infamously powerful and feared villain team known as Eurostar, the slightly goofy collection of opportunistic thieves known as GRAB, and many, many more. While the book does contain some missteps (Monster, I am looking at you!) overall it presents an extremely wide array of distinct and iconic supervillains that range in power from a threat to the entire world to someone your superheroes pause only briefly to defeat. The back of the book also presents Stronghold, a supervillain prison—complete with write-ups of the robot guards and the controversial “hot sleep” stasis technique to subdue especially dangerous supercriminals. Overall, this is a fantastic product and definitely very useful for any superhero campaign. Art by Denis Loubet. Time to smash some robots! Strike Force is one of the earliest examples I can think of that really takes the time to tell the reader how to run a superhero campaign. It has some of the best GM advice ever published (albeit in short and sweet compact form) and provides a ton of fantastic guidance for what to do… and, even better, what NOT to do. Strike Force is basically Aaron Allston’s home superhero campaign turned into a sourcebook, and there is a lot of stuff packed into this product; the team itself, their protégés, their enemies, their home base, their history and adventures. However, what really sets Strike Force apart is that it is a guidebook to how this campaign succeeded, and there is a lot to takeaway on how to improve your own superhero game and bring your players group with you on the journey. There are some flaws to the book; the GM advice, while absolutely great, makes up a smaller percentage of the book than you’d expect. The book was published in 1988, and compared to many modern sourcebooks it is quite dated. Lastly, it is definitely aimed at the mainstream superheroic genre, so it may not be applicable to games that are wildly variant from that tone. However, I think there’s something in Strike Force for every GM, no matter what system or setting. Possibly one of the best sections of this book describes the process of “bluebooking”: where the players continue to tell stories about their characters when away from the table, describing their actions and events that take place between each session. My players for the Shadows Angelus campaign (you can find a link to this over on the right) took to bluebooking with an intense passion, and I have Strike Force to thank for much of that campaign’s success. This book is a great addition for any game, but is particularly effective for superheroic games, and it deserves all the praise it has achieved. I love that the cover is entirely composed of dudes who mimic or steal other people’s powers. The title for this product says it all—from a very ambitious premise, the product manages to mostly pull it off—there are very, very few superheroes you can’t build using this book. I would go so far as to say (for me) that this is the benchmark against which all other “powers” books are judged. Plus, the random charts are amazingly entertaining for some beer & pretzels fun making crazy superheroes. 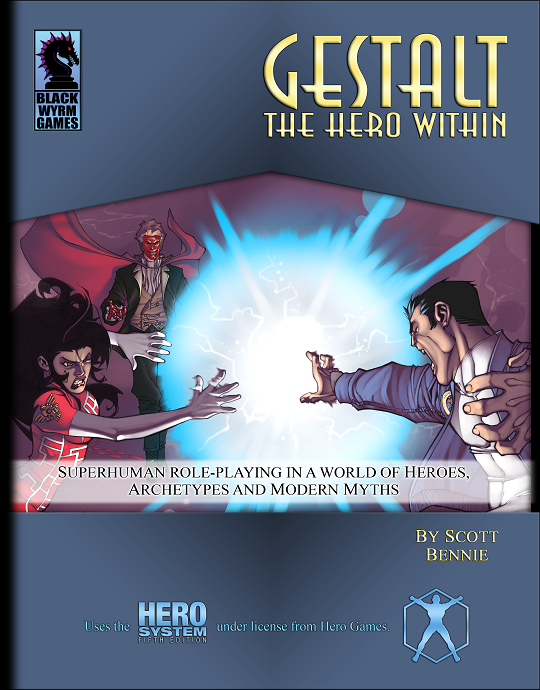 For serious gamers, the main attraction is going to come from sheer inspiration, as there are dozens upon dozens of powers and origins to be found within the covers of this product. Internal Limbo? Age-shifting? These plus lots more powers that I had never even thought about are included. It’s fair to say that the book has its flaws, however, from some awkward layout and art to many powers that are merely variations on the same theme. Overall, I am extremely fond of the book and I do still consider it to be extremely useful to a superhero GM. It is important to note that the addendums and errata for this product are nigh-essential. Art by John Zeleznik. I find most of his art really wierd, but this one is actually pretty good! This book deserves its own review (and I certainly intend to provide it, eventually). Suffice to say for now that Century Station is a very underrated setting book for superhero games. Century Station provides a great background for superheroes of all origins and ties it together with a surprisingly distinct, dynamic, and interesting background. 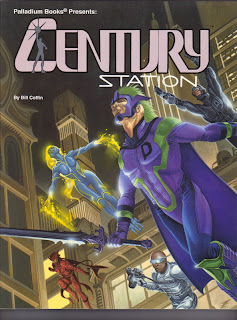 Personally, I love Century Station and recommend it to anyone who wants to find some great storytelling hooks for his campaign and a great place to stage the adventures of his superhero team. Bill Coffin is the author on this one and he has created, IMHO, one of the truly pro-active settings where superheroes don’t just sit around waiting for the trouble alert—in fact, they are highly incentivized to get out there and bust some supervillains before time runs out. An interesting list of characters, NPC’s, and zones rounds out this top-notch sourcebook. Along with #3 on the list (no fair skipping ahead), Century Station is a guide to how a superhero city/worldbook should be done. On top of that, the book features some truly brilliant and inspired examples of what the setting is capable of. The standout, for me, has to be the setting’s major villain—the Blood Red King. As the Gestalt of Murder, the Blood Red King is one of the most impressive, terrifying, and spectacular supervillains I’ve ever seen in any IP, ever. Art by Storn Cook. He’s possibly done the most Hero System book covers to date. San Angelo ranks very high on this list for one simple reason: it is a fictional city that /lives/ and /breathes./ Pat Sweeney somehow bottled lightning for this book, and his talent and passion for the subject is evident throughout the book. 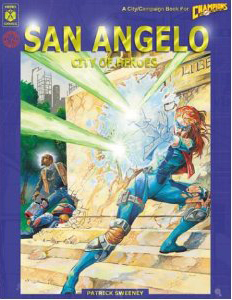 Kurt Busiek and Ken Hite both praise this product, and I would love to add my voice to that choir—San Angelo is simply the best superhero setting book I can think of. This is very high praise, and it is tough to top the truly excellent Century Station (sitting comfortably at #5 on this list), but San Angelo manages it with aplomb. The city is extensively detailed, from its history to the citizens and shops and neighborhoods that make up its vibrant and intriguing whole. In addition, San Angelo has some very, very good supplements (Enemies of San Angelo and Denizens of San Angelo amongst them) that build and expand on this setting even more. If you are a fan of realistic superhero settings, the Astro City comic books, or are just looking for an extremely well-built example of a fictional metropolis, look no further. My only criticisms are that some of the NPCs aren’t quite as compelling (although the supplements really help in addressing this) and the book would have benefited from making sure to set aside some areas for GMs to develop, simply because the rest of the book is so well-thought-out and detailed it seems to be almost begging for a GM to come in and make it his own. All in all, these flaws are tiny in comparison to the amount of things this book does right, and it absolutely deserves its spot on this list. Seeker, look o… okay, never mind. While superhero RPGs revolve around the concept of heroes and villains with special powers, not too many choose to comment on the not-so-super people in the world that really bring a setting to life. 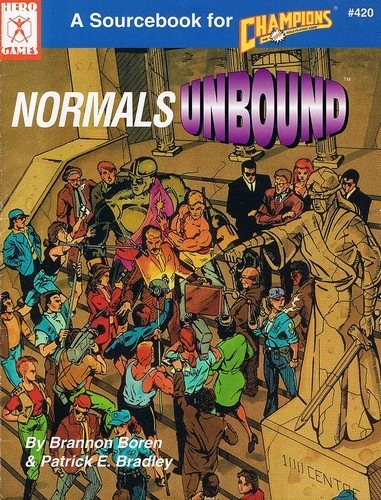 Normals Unbound is a sourcebook that provides dozens of “normals”—everyday people—that can take a mundane superhero RPG campaign and turn it into something truly special. The book contains NPCs from all walks of life, from the crippled-but-brilliant sibling to the super-base butler, from the karate instructor to the radio DJ, this book has it all. In addition, Normals Unbound doesn’t limit itself to only normal either… the book also includes a wonder dog, retired superheroes, a vampire (!) and an Artificial Intelligence. All of these characters are part of the wonderful tapestry of normal folks that you’d find in any quality comic book. Grab Normals Unbound to add some perfect foils, romances, enemies and allies to a superhero’s secret (or not-so-secret) ID in your superhero campaign. Why did I rank this book so high on my countdown? I consider the immersion of a campaign, the feeling of “bringing the world to life” in the players’ imaginations to be a critical concern—and Normals Unbound is one of the best tools in the toolbox, IMHO, for accomplishing just that. Featured on the cover: Backworld! The #1 spot on this list is a book that has never failed to give me some great ideas for my superhero games—Champions in 3-D. The purpose of this book is to provide GMs with guidance and settings for taking superheroes on journeys to other dimensions. This is a time-honored trope in comics and superhero adventures in general (The Justice League cartoon featured this prominently, as an example), and Champions in 3-D succeeds wildly at its task. There are a handful of detailed, fully-developed dimensions to visit, from a swords-and-sorcery fantasy world to the realm of dreams to a world of Cthulhu-like horror. My personal favorite is Backworld, a bizarre mirror-universe where the heroes are villains and vice-versa. Each of these settings includes a full adventure for your superhero team to explore the dimension and meet its unique challenges. The book also contains a useful random-dimension generator, and the last third of the book is entirely devoted to presenting one-page short dimension concepts, with some wild ideas (such as Viking World and Wimp World—both great for less serious campaigns) alongside many more useful and interesting dimensions that are suitable for a wide range of campaign types. Why is it #1? 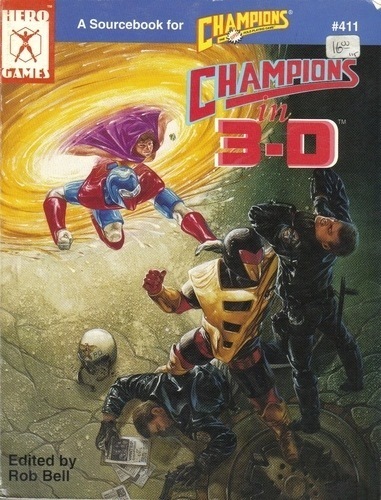 I picked up Champions in 3-D at a time when I was getting a little tired of the typical superhero RPG game—on patrol or in the base, waiting to encounter a “trouble alert” or get attacked by a supervillain. This book helped wake me up to the ideas that there’s a lot more out there to do, to explore, and more importantly, to experience as a superhero and how best to bring that across in an RPG. If you want to celebrate the archetypical superhero adventures through space and time, this is the book for you! Thanks for including Century Station on your list, Ross! I’m really flattered you placed it at #5, especially since that’s ahead of the Ultimate Powers Book, one of my own all-time faves. It’s a great book, Bill! I’m planning on giving it a full review and I will be sure to let you know when it’s done. Good solid like. Nice to see Ultimate Powers made it on the list. That book is my favorite! My only quibble with this list is the limited set of RPGs you showcase. Or M&M sourcebooks such as Paragons or The Nocturnals? Heck, Some of the M&M sourcebooks I have easily surpass their Hero System equivalents for the wealth of material they offer about the genre they cover. Good points, and I definitely have a pro-Hero bias on this list. Stay tuned for my next installments, though–I certainly plan on looking at some M&M books! And I wasn’t really aware of Crescent City–I’ll have to go check that one out. Part of the fun of lists like this is I think it helps people see stuff that they may have missed and inspire them to find some classic gems to add to their collections. Great list! I remember how stoked I was seeing the original Champions RPG when I was a few months into D&D and thinking “Holy @#$&! !, they make games like D&D- but with superheroes???!! !” I immediately handed over three weeks allowance, went home and started creating all my favorite superheroes and villians over the weekend. I’d toss in Dark Champions to the mix along with Crescent City and Golden Age (another M&M Sourcebook). Lots of cool stuff with V&V, Golden Heroes (now called Sqaudron U.K.), Silver Age Sentinels, Heroes Unlimited as well. 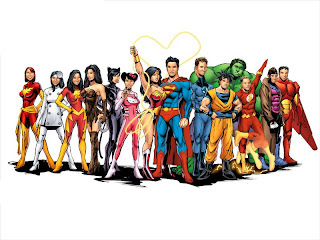 Lots of superpowered goodness out there- with or without a big name IP behind it. Never been into books made up of write-ups so a lot of those do nothing for me. I already have a million heroes/villains/NPCs. Same with city write-ups. They always seem to come from guys who like a VERY different style of super hero gaming than I, plus I hate fake cities. Oh how I wish someone would do a book on NYC oriented towards super hero action and written for non-natives like me. Maybe a series of books covering different places. Doubt it would be a money-maker, unfortunately. I still use the TSR MSH NYC book! Now a book like Villainy Amok I can get into as I can get some plot ideas and advice on handling scenarios. The GM Guide for Heroes Unlimited has some good bits to rip off and modify despite being full of lousy art and that while HU ultraviolent vibe. UPB is great just for unusual powers inspiration. 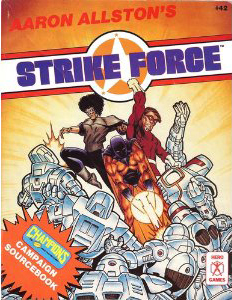 Still looking for an affordable copy of Strike Force. Surprised you didn’t include Champions 5th edition sourcebook as it’s filled with great advice, tips, and ideas. I have no use for 5th ed. Hero System as I play 4th ed. Champions/Hero, but I come back to the 5th ed. Champions book time and again. Even the characters used for examples are fleshed out and intriguing: I would love to read more about Freedom Fighter and Snow Leopard and Greycat and the Black Swordsman!